Bruce Lee's own functioning Timex wristwatch, set in a heavy 2.5'' wide leather band with hardware decoration of four metal rings and six metal studs. Numerical watch face, with winding mechanism, has a white face with black numerals, and date window. 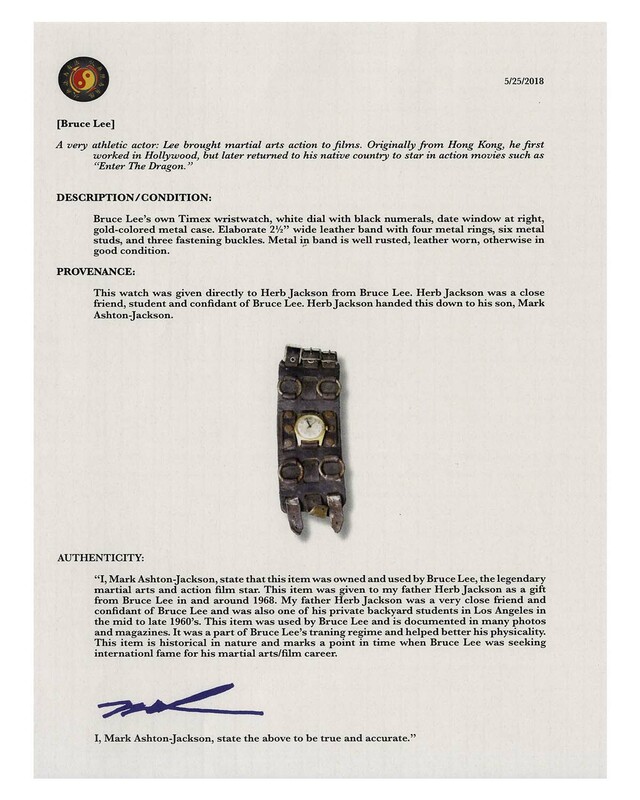 From the collection of Herb Jackson, Lee's friend and first generation Jeet Kune Do protege, to whom Lee gifted the watch circa 1968 before moving back to Hong Kong. Some rusting to metal and rubbing to finish, but fully functioning, in very good condition. With a COA from Jackson's son. Watch showcases Bruce Lee's classic masculine and iconoclastic style.